Happy spring! Has the rain really stopped for a little while? Well, while it has, some small but important “fixes” have been accomplished around The Circle in recent days. 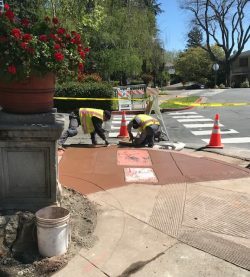 Sidewalk repairs: It’s become a little safer to make the circuit around The Circle — at least on the sidewalk. City crews have been out to repair some seriously dangerous spots where pedestrians might trip or fall. 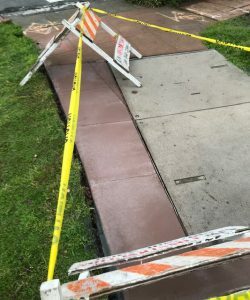 One spot is the sidewalk surrounding two large metal utility plates between upper Marin and upper Los Angeles. A crack large enough for someone’s foot to slip into had developed as the plates shifted over time. After briefly filling the crack with asphalt, city crews redid a large area around the plates, erasing the hazard. A historical sidewalk “footnote”: When it was developed after the turn of the last century, Northbrae was outfitted with pink (rose-colored) sidewalks as a distinguishing characteristic. Over the years, most updates and repairs to area sidewalks also have been done in varying shades of pink. The newly fixed sidewalks on The Circle are, according to the men laying them down, done in what the city calls “Berkeley Pink” cement. Street sign back up: A few weeks ago, a vehicle apparently ran into the street sign pole that marks the top of Fountain Walk at The Circle. 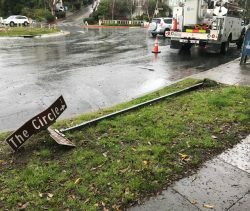 A neighbor all the way around The Circle on Marin found the toppled pole laying on their parking strip. Before the city could reinstall it, someone made off with the street name signs, so new versions had to be made. Once they were, the pole was reinstalled and those wandering The Circle’s sidewalks could find their way to Fountain Walk again. Fountain’s flickering lights: This problem may not be entirely fixed — yet. The lights in the main pool of the Fountain at The Circle have been going off sporadically over the past several weeks. City electricians and our own fountain maintenance crew have investigated and not found the exact cause, and the problem seems to come and go, with the lights working normally for days at as time. We now suspect there may be a short occurring in one of the fixtures in the pool that is tripping a circuit breaker. We’ll keep hunting until the problem is solved. If you’d be interested in joining the crew of volunteers that keeps the fountain flowing (and lit up! ), go here to send us an email. Finally, an FOFW volunteer workday: The winter rain that seemed almost constant seemed to fall every first Saturday of the month until April, canceling our regularly scheduled work parties for months. Some of our intrepid volunteers managed to get out and do some weeding, raking and sweeping on other days in between storms, but until this month we were far behind on our normal upkeep. 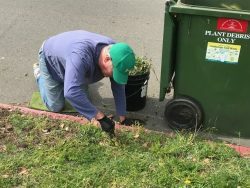 We had a good turnout on April 6, though, and made some progress, including pulling a lot of weeds and mowing some of the overgrown grass and groundcover. With luck (and a little more dry weather) we should be able catch up on maintenance soon. You can find out about our volunteer workdays here. 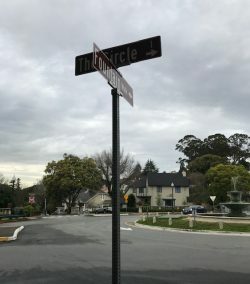 FOFW thanks the City of Berkeley’s public works department, the park and rec maintenance crew, city electricians and the city gardener crew for all their work keeping the fountain, walk and circle in shape. And special thanks to the office of District 5 Councilmember Sophie Hahn for its support of FOFW and its mission. And thanks to all our Friends of the Fountain! Want to join or support us? Go here or here.